Nowadays, email is considered as one of the best channels to communicate thanks to its flexibility, universality, and familiarity. However, marketers from all over the world always have many problems using email marketing efficiently, and the main reason for that is the lack of strategies. Having an effective and unique email marketing strategy is vital for any business. Newsletters are one of the pillars of email marketing strategies because they help us to build loyalty, inform and drive traffic to our website. In this article, we give you a guide to creating email marketing strategies in order to communicate value to customers and boost your sales. The biggest mistake that marketers can make is building a bad database. Remember that you always need to be aware of email lists. Many companies tend to buy email lists, but this action can destroy your email marketing strategy because, for everybody, it´s very uncomfortable to receive emails from unknown senders. Unfortunately, it doesn´t matter how persuasive your messages are because if they are sent to the wrong subscribers, you will probably waste two important things: money and time. Furthermore, knowing who will be your addressees can give you clues about which style and language are the most appropriate. You must gather every kind of information before starting to create your email campaigns. Marketing is about creativity to achieve goals like selling new products or promote services. Because of that, you must be very creative with your messages in emails. Many emails from different companies look exactly the same, and they are boring and ineffective for readers. The key to email marketing strategies is to innovate and use original solutions, and it does not matter if companies use free email blasts for their email campaigns. Let´s talk about creativity in email marketing strategies through the overall design of the email, based on images, content, colors, and layout. Readers usually have images turned on by default, which means that emails will be difficult to display on your readers’ devices. So, you must simplify and provide attractive images based only on your content. 600px must be the width of your emails because most subscribers use up to 600-700px to the email viewing window. To optimize images and content your design must be easy to scan by readers, so you must use bullet points, headers and infographics style imagery as well. One of the new trends in email marketing is to use enough white space in the design and concise content. It´s important to give to your readers a taste of your content if you want to make them click on links. White spaces help to alleviate a cluttered feel, and your subscribers or readers can click the right link inside your emails easily. For email marketing strategies, titles are essential, and they must be electric. On the other hand, you must avoid boring subject lines in your emails because the subject line is what makes readers open an email. You must create subject lines in a conversational and personal way. Another trend of email marketing strategies is the use of GIFs within emails. This practice has many advantages, and people of all ages are used to use GIFs every day for Whats App messages, emails, social media and blogs. GIFs are easy to consume, that´s the reason why they help to create strong connections with readers. Using GIFs, you can touch reader´s emotions. Through the use of adaptive content with video you will enhance the creative and engaging components of our emails. Be focused on what you really need from emailing and for it. In other words, your primary goal with each email. So, you might use one call to action (CTA) for one main thing rather than many CTAs. Experts in email marketing strategies such as Neoattack.com affirm that it´s handy to catch readers´ attention using colors like red, pink, white, yellow, and purple. You have to write positively, and you must know how to construct sentences to make them attractive and coherent to readers. So, be open-minded and think what your customers need! Needed to remember, that email marketing helps businesses to communicate their value and to connect with customers. 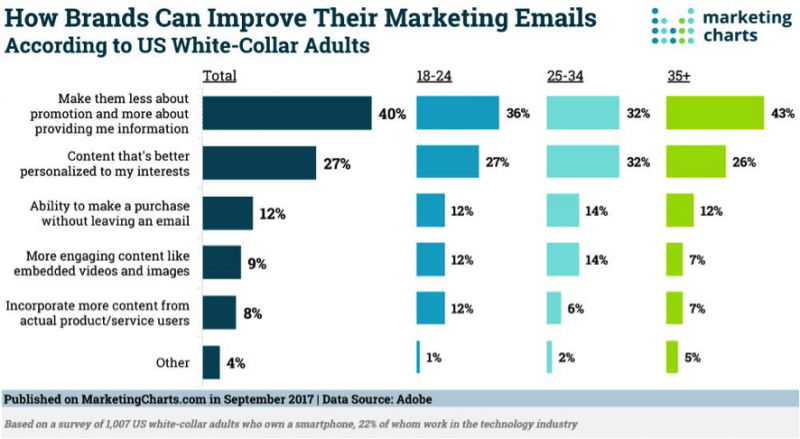 According to one of Adobe studies, customers are interested in changing about emails that they get from brands and in receiving less promotion and more information from those emails. Due to this study, 40% of people would like more information in emails instead of advertising so that brands can improve their marketing emails taking into consideration that aspect. You must analyze your metrics and study when your current customers and new customers open your emails. Through email platforms, you can always measure and test what timing works best for each subscriber. At the begging of your email marketing strategy, you will not know exactly everything about your customers. However, after a couple of weeks, you will be able to identify when is the right time to send your emails. If you want to send an email to your customers and stand out from the rest of their emails, you cannot use sender emails addresses like “do no reply.” The best way to do it is using recognizable names that can provide confidence and interest to your subscribers. Using generic addresses will definitely push your readers to skip your emails, and your email marketing strategy will be a disaster. Emails are a perfect opportunity to humanize brands. So, instead of communicating through newsletters like a salesperson who tries to sell something, you must seem like you are just giving your advice to make people happier in their lives. For example, two simple ways to humanize your emails are: saying thank you and wishing a great day to your readers. Topics such as challenges, obstacles, and failures, are always lovely for people because they love feeling identified or motivated. It´s useful to send few emails per month which can provide information. 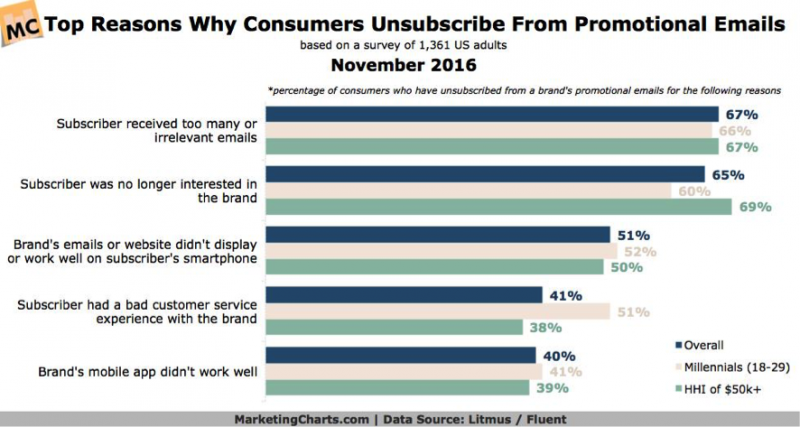 According to several studies like Mapp survey from November 2016, the best optional if a brand uses receiving emails less frequently to keep its subscribers. We hope you´ve found this article useful and will increase profits through email marketing strategies by following all our recommendations. Pilar´s graduated in Journalism by Universidad Complutense de Madrid . After being working in El Mundo and Gestiona Radio, she decided to move to the States. She lived in Orange County, where she studied Marketing and Social Media Communications at University of California Irvine. Currently, she´s working as Content & SEO Manager in a spanish digital agency.